The next upcoming Maundy Thursday is on Thursday April 18th, 2019. Maundy Thursday is the fifth day of Holy week, a Christian observance also known as Holy Thursday or Covenant Thursday that falls every year on the day before Good Friday. The day commemorates for Christians the last supper where Jesus Christ consecrated bread and wine initiating Holy Communion or the sacrament "Eucharist". Maundy Thursday is not a public holiday so government offices and businesses will be open on this day. .
Catholic churches will often hold evening Mass or services where holy oils are blessed and later used on Holy Saturday and Easter for baptism and confirmation for those who enter the church. Many who go to church on this day will receive Communion and in some churches the priest will wash the parishioners feet to re-enact Jesus Christ's washing of the disciples feet. Some churches will have pot luck's and get together after service as well as collect offerings to give to the poor. Maundy (Latin for commandment) Thursday or Holy Thursday is the fifth day of Holy week and the day before Jesus's crucifixion as told by the Bible. 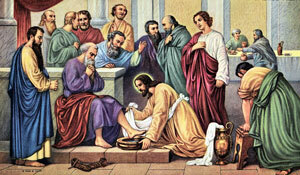 Jesus on this day prior to the last supper washed the disciples feet to share his love and show humility. The Christian sacrament Eucharist came about by Jesus consecrating or "making holy" the bread and wine during the last supper on this day.